Thus far the Whitby Historic Lifeboat Trust and the William Riley have started the year straight off with a fundraising venture. 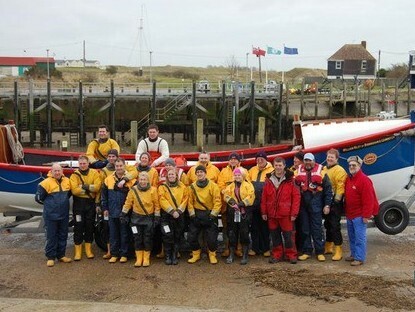 The volunteer RNLI crew from Rye Harbour, assisted by volunteers from Dungeness, stepped back in time on Saturday 29th January to row the historic Upgang lifeboat William Riley of Birmingham and Leamington from Rye Harbour to Hastings and back as part of the RNLI SOS Day 2011. The station at Dungeness guards the Channel from Folkestone to Rye Bay and operates a Mersey class fast carriage lifeboat Pride and Spirit which was stationed at Dungeness in 1992, it was a generous gift from Eric and Jean Cass. The following YouTube video is a video showing one of the RNLI Mersey Class Lifeboats at sea and is well worth watching. The RNLI's SOS Day has become the annual major fundraising day for the Royal National Lifeboat Institution. Anyone wishing to sponsor the volunteers can do so at Just Giving website, a facility which to date (10-02-11) has raised £320. The remaining voluntary crew and fundraiser's at Dungeness lifeboat station were planning to take part in a sponsored 24 hour bike ride on Friday 28th January and finishing on Saturday. A car wash day at the boathouse was to be held on the Saturday called Soap Our Saloons. People were invited take any car to the boathouse for the voluntary crews to clean for just £5 a car. 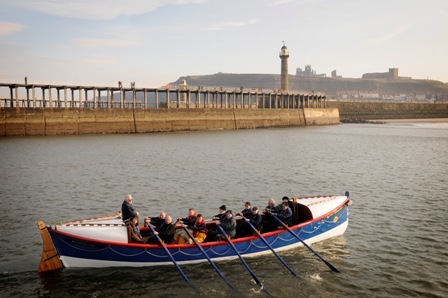 The boat's next engagement was in its home port of Whitby on Wednesday 9 February, where a service of remembrance was held to commemorate the twelve men who died during the great storm of 1861 in one of the region’s worst lifeboat disasters. Whitby's lifeboat capsized with the loss of all but one of the crew, Henry Freeman. The men had been attempting to rescue sailors from a stricken collier called Merchant and had put the lifeboat to sea for the sixth time that day. 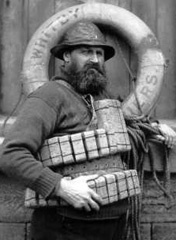 Henry Freeman, was on his first lifeboat launch and is thought to have survived because he was the only man wearing the new design of cork lifejacket. Freeman was awarded an RNLI Silver Medal for his part in the incident and went on to become one of Whitby's most renowned lifeboatmen during more than 20 years as Whitby RNLI Coxswain. To commemorate the 12 men who died, there was a short Act of Remembrance on Wednesday 9 February at Whitby lifeboat station. Whitby's all weather lifeboat George and Mary Webb and the William Riley were launched and descendants of some of those who died joined members of the lifeboat crew to scatter roses at the spot where the lifeboat capsized. On Sunday 13 February at St Mary's Church, East Cliff, Whitby, a Service of Commemoration was attended by the lifeboat crew and the Bishop of Whitby. Marske Fishermen’s Choir performed a song written about the Whitby lifeboat disaster. 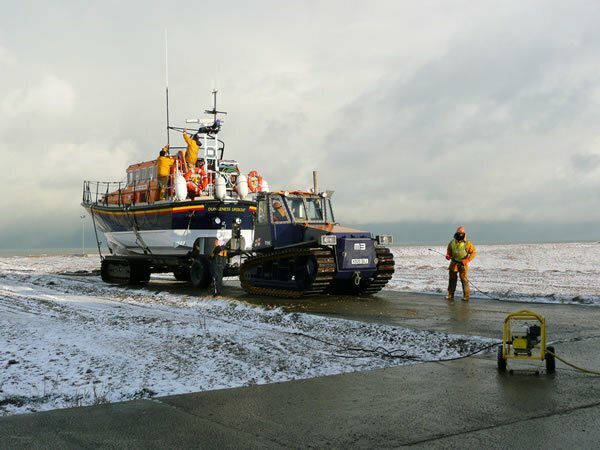 Current Whitby RNLI Coxswain, Mike Russell, said the lifeboat disaster had a huge impact on the town and led to Whitby's lifeboat service being taken over by the RNLI. On the day of the first service the weather was dry but overcast, thankfully though it remained dry and the commemoration passed off with a large attendance. I aim to add some images from the event however in the meantime I have added a small sample of the service outside the station presented by BBC Tees Radio. As well as radio reporters news crews from around the region descended on Whitby, my latest addition to the website is video news footage from both Tyne Tees and BBC news programs, there is also a detailed report about the tragedy and the commemoration on the Real Whitby website.